Happy St Patrick’s Day!! I don’t think I own a single green shirt, but I don’t mind the extra pinches. Come and get me! Also, feel free to send a smooch my way because I definitely have some Irish in me somewhere even in my Greek side shines through a bit more obviously. Ok, more than you cared to know but for all of us, Happy Friday! Can you see my rainbow themed art project that I tried to convince the girls was cool? They still opted to do their own thing. Because Belle. 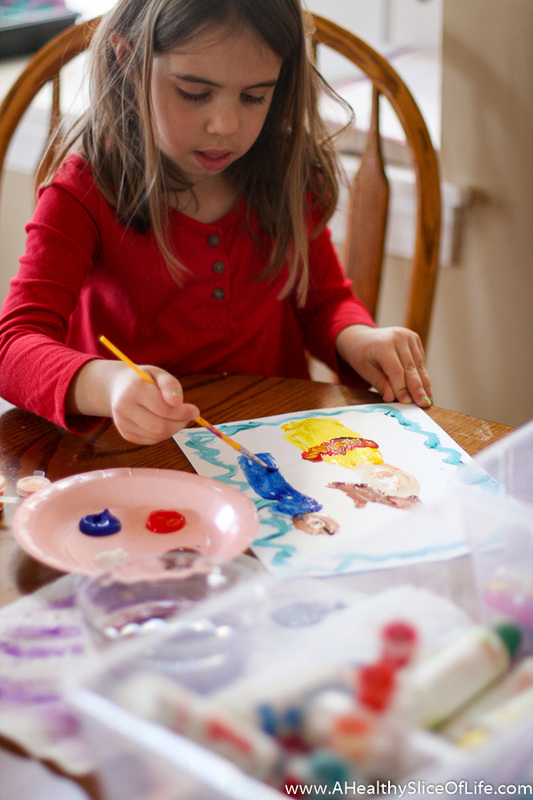 Hailey is always drawing/painting/coloring/acting like Belle. Does anyone know if the new live action Beauty and the Beast is OK for a 5 year old? I’m realllllly wanting to take her. 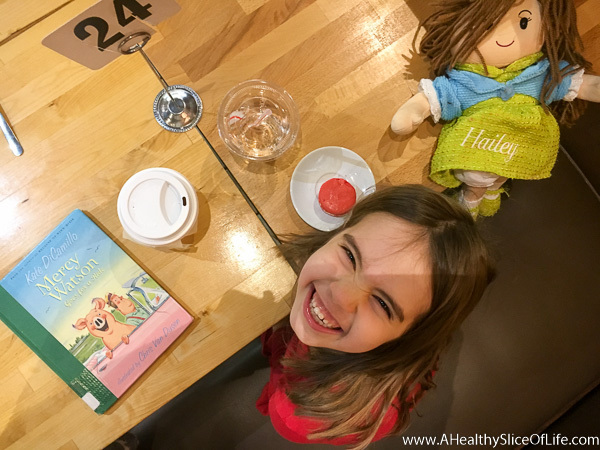 In other snapshots from the week, Hailey and I had a mommy daughter reading date at a local bakery. I picked up one of the Mercy Watson books from the library after a reader (hi Angie!) recommended them as a good introduction to chapter books. The chapters are super short (like 2-3 pages) and it’s a cute story. Hailey kept asking to continue, so we ended up reading the entire thing aloud in about 40 minutes. It has more pictures than regular chapter books which kept her more engaged. 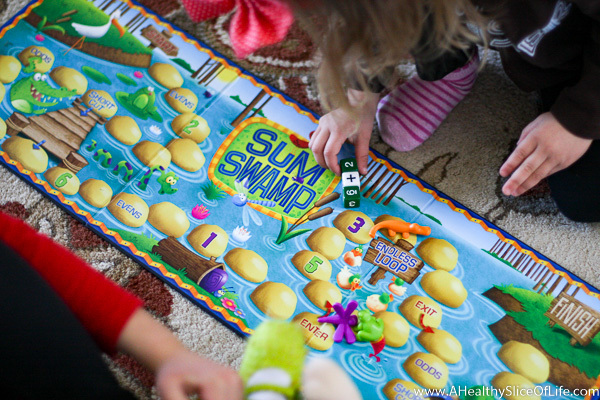 While we are talking educational things, let me highly recommend SUM SWAMP to you. It says for ages 5+ but with generous help with the math portion, Kaitlyn happily played 3 games with us yesterday. It’s fantastic for practicing simple addition and subtraction and talking about odd and even numbers. Plus, it was so much better to play as an adult than the simple, mindless games like Candy Land. Two thumbs up! Before moving on to some click-worthy links, I want to share the tasty dinner we had last night. 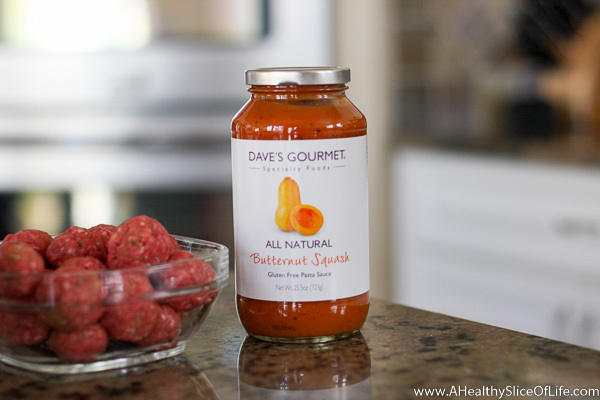 I snagged this Dave’s Gourmet gluten-free butternut squash pasta sauce when I found it on sale. The girls and David gobbled it up with pasta, meatballs, and roasted broccoli while I cooked up some quick frozen cauliflower rice for mine. Still struggling to adjust from the effects of Daylight Saving Time? Here is why we even have to do it in the first place and it’s NOT because of farming. 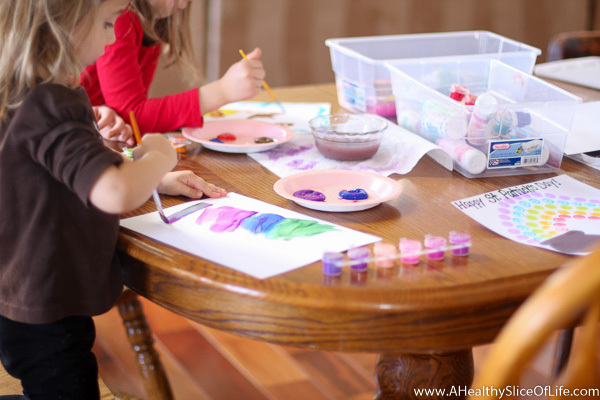 How to make a simple weekly homeschool schedule. I see myself using a similar setup/system to plan our days starting in the fall. I really want to try making Angela’s favorite pasta recipe for kids. It’s super simple sounding! Spring 2017 reading list. Because really, I want to start reading more at some point (she says yet again). My never-ending fascination with hormones continues. Changing the way I eat at certain times of my cycle helps SO much! When hormones don’t play nice. I just ordered this bathing suit and am crossing my fingers it looks as cute on me as it does on the model so I don’t have to splurge on the bathing suit I’ve really been pining over. 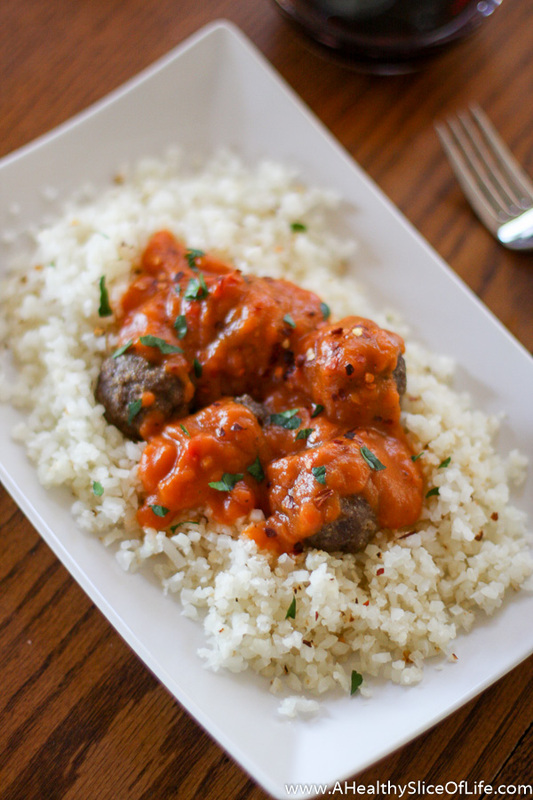 Need a healthy lunch bowl/quick dinner option? Brittany’s kale and sweet potato brown rice bowls look SO good. 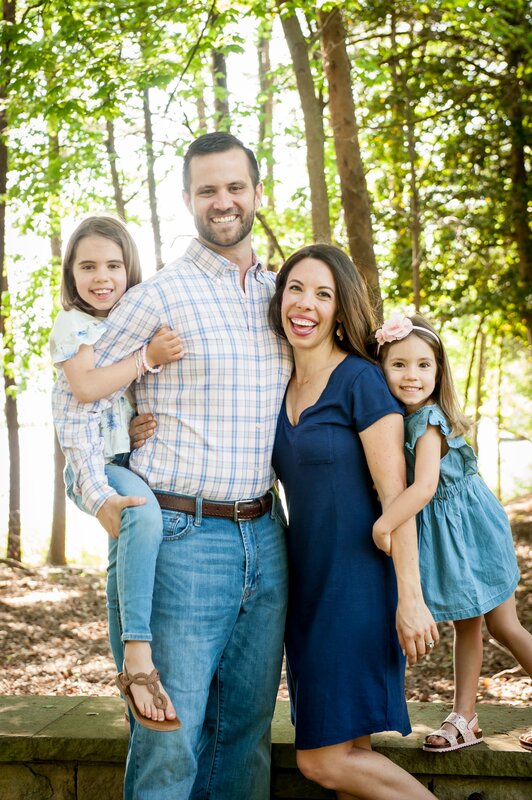 4 Reasons your phone call to a stay at home mom goes to voicemail. I never would have understood it myself before having kids but, yes, so true. Have you guys jumped on the latest smoothie trend? FROZEN CAULIFLOWER in the smoothie. Yep, sounds bizarre but we’ve been doing it for a few weeks and it’s amazing. No flavor at all (like spinach) but adds a high level of creaminess, plus no color added for discerning kids. TRY IT! If you need a recipe, try Julie’s yummy strawberry banana version. What kind of mom you are going to be based on your zodiac sign. Yes, the title is total click bait, but I bit and was seriously shocked at how spot on mine was. Check yours out! Instead of asking do I have the time? try asking is this a priority? A good read. 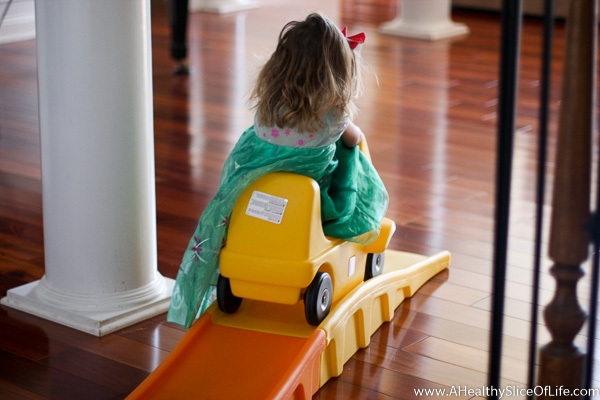 The roller coaster from Christmas is still a big hit with young and old alike… yup, I totally ride it too. I hope you all have a fulfilling and wonderful weekend! Have you seen Beauty and the Beast? Have you read anything lately of interest? Your reading date with Hailey sounds SO cozy and sweet. I can’t wait to do things like that with my little guy when he’s older. I want to see Beauty and the Beast too! That was always one of my favorites as a child. I like to check common sense media before we head to the movies. It’s more conservative than I am, but it does clearly let you know what you’ll see in the movie. Good perspective, even when I don’t agree with their recommendation. And if Belle is the role model your 5 year old (and mine) have picked, I think she’s a good one. Loves books, knows that what’s on the inside is what counts, and is brave and kind. I’m glad she liked Mercy Watson! It is an easy read but it’s great to find a book where they want to keep reading and find out what happens at the end! Happy St. Paddy’s Day for that smidgen of Irish in you, Lass! Celebrate well with a spinach smoothie – or a tasty brew with David! Love the way you are loving teaching your kids the basics of literacy. I’m not a parent, but I saw the movie last night and I thought it was fine. And there were kids in the audience. Happy St. Patty’s Day!!! What a cute reading date!! Love new links- thanks for sharing! Carrie this fit chick recently posted..Friday Favorites + Happy St. Patty’s Day! I heard it has 2 scary parts. I still plan on taking my crew 6 and under to see it. I’m dying to see B&B (I loved the Disney one as a child) and I have three-year-old twin girls. I’m a little worried about having them watch it so I would love to know if it’s suitable. That bathing suit is super cute. Going to see B&TB this weekend!! So pumped. I’m seeing it with my friend who I’ve known since kindergarten so it’s going to be totally nostalgic for us. Target has the best copycat swimsuit deals!!! My son has the same roller coaster and loves it! And the zodiac post totally sucked me in! Oh my gosh yes! Cauliflower in smoothies is a great new discovery!! Love the creamy texture and bonus added nutrients! Also, be sure to update us on the cute Target copycat swimsuit! Sure is cute. I’ll definitely be trying the cauliflower! Costco has a great price on multi-color frozen cauliflower- white, green, purple and yellow! I think you mentioned before you are not close to a Costco, but with the way you eat (healthy/ fresh) you would love it! I have often wondered myself how far I’d be willing to drive to a Costco… I think 1.5 hours, maybe once a month, would be my limit 🙂 Sorry, way off topic from your original post! I heard a couple parents reviewing B&B on the radio this morning. They both said there were a couple parts that made their kids pretty anxious (scared). They said maybe not take kids under 5. Love all the links you shared too. And that bathing suit from Target is super cute. I hope it works out! thanks for linking to my sweet tater bowl as well. It’s one of my favs. 🙂 Cheers to the weekend! I would love to hear more about eating based on your cycle. Have you ever posted about it before? I haven’t posted specifically about it, but basically if I go almost completely paleo (I still eat some cheeses like feta and a smidge of whole grains like rice) and limit caffeine, my periods are 100% less painful. I have a history of really painful cycles (including ovulation) and I’ve been experimenting for several months on natural ways to make it more manageable. If I ever get it completely down, I’ll definitely post about it! Hey brittany! Your bff from Texas here 😁 Just wanted to say that you should listen to the homeschool sisters podcast. They are awesome!! Also, belle is the best!!! And I hope the movie doesn’t disappoint! And check out the princess in black chapter books by Shannon hale. We have read the first one and my girl loves it!! I binge-listened to all the episodes and love them. I brought my five year old to the new movie! She loved it. It is a bit darker and more scary, maybe, but you know your kid best. She did great! I saw Beauty and the Beast and I think Hailey would love it! That butternut squash sauce looks amazing! And I’ve been thinking about swimsuits too lately. I’ve just never purchased a great one without trying it on in the store! Hope your new one works out!